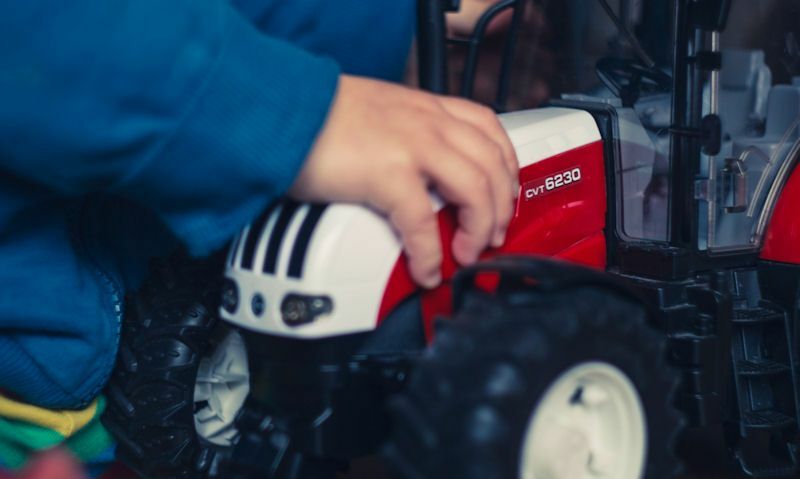 Bruder farm toys come in 1:16th scale only, and are huge so this should be taken into consideration when investing in your first Bruder tractor and implement. In a sense, the bigger the Bruder farm vehicle, the smaller the farm scene becomes. So pushing, reserving and manoeuvring this bulky vehicle becomes a problem with space running out on the floor. You'll have this issue with little space available in the bedroom, dining and living room for your child to push along the Bruder tractor on the carpet or laminated flooring. The length of the Bruder tractor already measures about 18 inches so with a trailer and front loader fitted to the tractor, that's a whopping 32 inches at least, or in other words... 3 feet. To overcome this obstacle you'll need to think about investing in a Bruder tractor for play outside in the garden - on the lawn or patio - but thankfully Bruder toys are made for outdoor play. But this is not the end for indoor play, Bruder tractors are replicated in 1:16th scale exactly. So real life big tractors are big toys to, but toy tractors based on smaller models look close to 1:24th scale - and that fits in with Schleich and Bullyland farm toys too - so bonus. All you need to worry about then is finding matching Bruder farm implements and trailers that will suite your smaller Bruder tractor.